Treasured, valuable and with spiritual significance, pounamu – New Zealand’s highly prized stone – has been used by Māori to denote status and authority, for adornment, and for making peace. It is only found in the South Island, so it is very important to the tribe there, Ngāi Tahu. The boulders are often found in or near rivers. 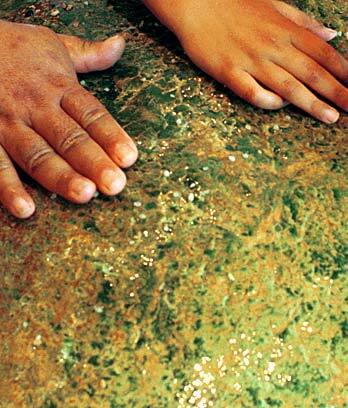 Pounamu in its natural state belongs to Ngāi Tahu. At first, Māori used the stone to make tools such as adzes, chisels, gouges and knives for carving and cutting wood. Sometimes they made fish hooks, hammer stones and points for spears. They used sandstone to shape the pounamu. Māori made pounamu into earrings, necklaces and rings. The most well-known type of neck pendant is called the tiki. This is shaped like a figure sitting cross-legged, with its head on one side. Pounamu weapons were used for fighting, but they were also carried by chiefs to show their high status. They were also used in ceremonies, and sometimes they were given as a symbol of a peace agreement. These items were treasures. They were often given names and reminded people of stories about their ancestors. Te Āwhiorangi is an adze that is said to have been used by the god Tāne. He used it to cut the bindings that held Ranginui (the sky) and Papatūānuku (the earth) together. Today, people sometimes use a helicopter to lift a pounamu boulder from a river bed. Carvers use diamond-tipped tools to cut and shape the stone, which is made into souvenirs and art objects.